RodPrjónar: Aeolian: A shawl that made me think about my first steps in knitting lace. 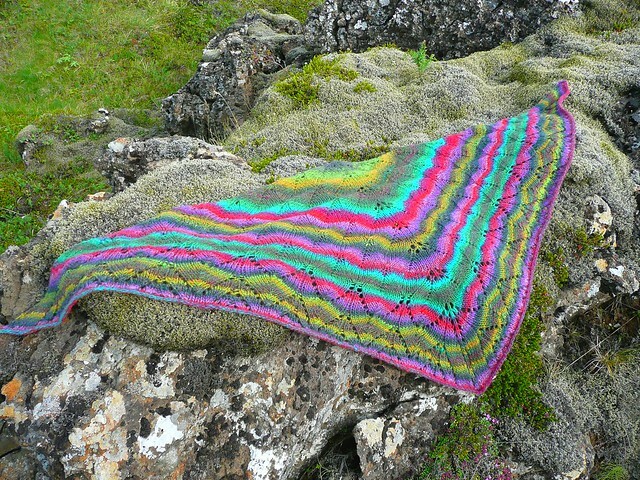 Aeolian: A shawl that made me think about my first steps in knitting lace. 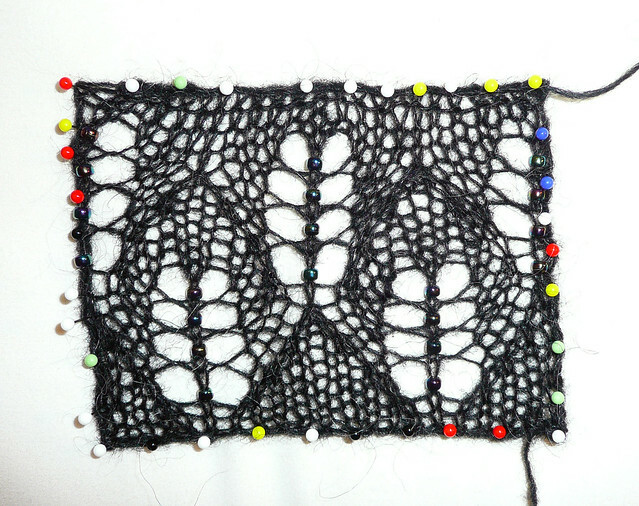 My journey on knitting lace began in June 2009, six months after I began to learn how to knit. Lace had alway cought my eye because of how complicated it looked and it was definitely a challenge! I started to look for patterns on Ravelry until the Springtime Bandit came my way. It looked nice and not so complicated. By then I really wanted to try something that wans't lopi. Since I had started to knit back in December 2008 I had only used lopi, mainly because of its price and how easy it is to knit with it. 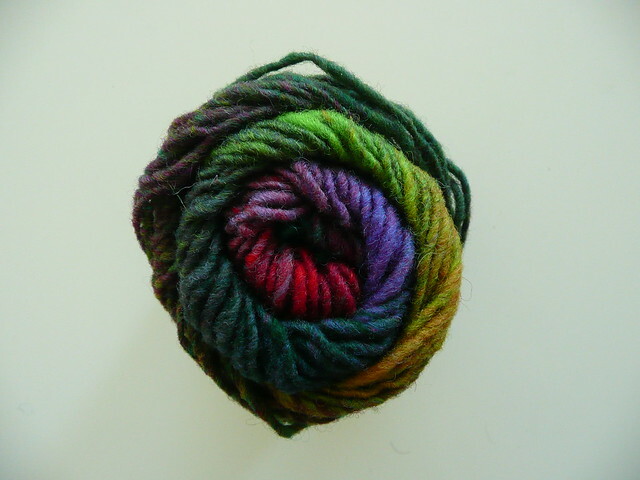 Among the yarns that I wanted to try it was Noro in its wonderful colors! 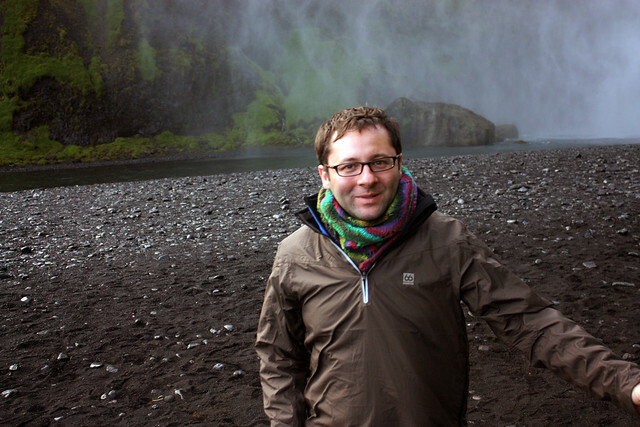 I began to look for Noro in Reykjavík until I found it in a shop called Storkurinn. Even though it was HUGELY expensive I bought 5 skeins to give a try. * Crochet provisional cast on. * That decreases slant! Yes... that was a huge discovery! And that slanting thing meant that I had to switch all the decreases of the pattern in order to get the lace well made because I am left handed! * Blocking. This was the first project that I had to block and stretch for real. I remember that I had to block it twice because the first time I was so afraid of breaking the shawl that I didn't get it to blossom and show the pattern nicely! About Noro... I think that it is totally over rated and over priced. It was really nothing special about it. It even had lots of knots! (I gave Noro a second chance but this time with Silk garden... it was much nicer and softer (and more expensive as well) I made a baby surprise jacket). The shawl ended up frogged and later on became a cowl that my sister owns now. After I finished my first shawl I saw the Aeolian for the first time on Ravelry and I fell in love with it. I liked it so much that I decided to try to knit it. The furthest I got with it was the swatch which was a loooong and painful process. I think that I was definitely aiming to high with the little experience that I had by then in terms of knitting. I found it hard to handle the thread (einband, the thinest band I had tried that far) and the beads were a headache. I put the Aeolian to sleep but a few weeks ago Kristín Hrund, Gummi and me were talking about how much we wanted to try to knit the Aeolian so we decided to make our own knit along (KAL). It will be really fun to see how similar or different out shawls turn out! Now, I guess that after having knitted a few shawls the Aeolian will be much more simple than it did back in 2009!! I am using on skein of Evilla 8/2 that I had left from knitting last Hyrna Herborgar that I made. The colors are so nice and go so strangely well together. For now I am done with the set up chart and 6 repeats of the Yucca chart. 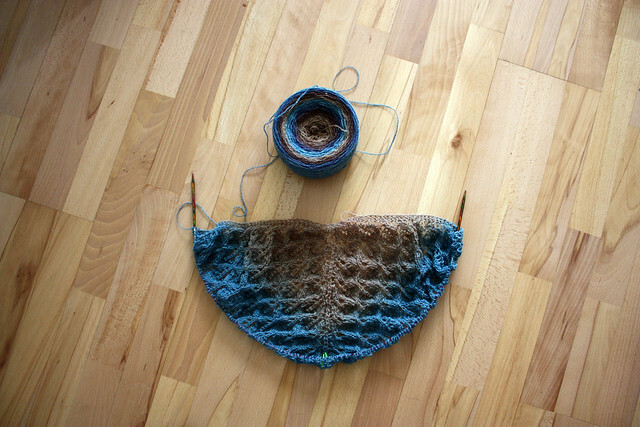 The pattern calls for 4 repeats of the Yucca chart for a shoulderette and 12 for a shawl. So I am making something in between. I decided not to use beads this time. I think that it would be too much added to the color changes. But it will definetely have the nupps in the edge (I love nupps! Both to make them and the way they look!). I have also finished the little bobbin lace sample that I was making with the new cotton thread that I found in Reykjavík. I am very, very happy with it! This is the first somehow more complicated pattern that I make using the bobbins. It is a combination of the exercises I made at the beginning. I am very pleased with this little piece!! * A foot (which is the base of the piece). * A torchon ground (made using half stitch). * A fan (the orange section). It is so nice and relaxing to work on bobbin lace! And it is above all very rewarding to see the results even though it is a small piece. Now I am thinking about the next piece to try! La lana Noro tambien a mi me tiene tentada, sobre todo por los colores tan bellos que quedan perfectos para tejer el Revontuli shawl, acá a Chile tampoco llega esa lana, con cambios de colores tan bien combinados, la BSJ tambien queda preciosa tejida con Noro. Y el encaje de bolillos, no se, es demasiado para mi, ahora y en el futuro tambien jajajajaja cero posibilidades, te juro, me estreso de sólo mirar las fotos. allt svo hrikalega flott sem þið gerið og litirnir í sjalinu eru æði : ) Takk fyrir síðast , hlakka til að sjá ykkur fljótlega , þá ætla ég að sýna ykkur sjal sem langaamma átti. Hola Rodrigo!, que lindo tu blog! y que lindo el chal también, no sabes cómo me gustaría poder dar esa forma a mis chales, pero no se si lo hago mal o la lana no es nunca al 100%, pero no me quedan tan lindos, eso si abrigan harto jeje (hay que ser positiva verdad!). Bueno, muchos cariños desde Chilito. Patty y Polita: Muchas gracias por sus palabras :) Las lanas Noro vienen en bonitos colores pero en realidad yo personalmente encuentro que no tienen nada de especial además de eso. Si llegas a comprar Noro compra la que se llama Silk Garden, es un poquito más cara pero es mucho mejor que Kureyon porque tiene seda :) Espero que puedas poner tus manos sobre Noro pronto! Comprar en internet? Sobre los bolillos... son ADICTIVOS! Cuesta entenderlos al principio pero una vez que se conoce la técnica básica se hace mucho más fácil la cosa. Saben si en Chile se pueden comprar bolillos? De qué parte de Chile eres? Acabo de conocer tu blog y he de decir que me encantan tus tejidos, te seguiré de ahora en adelante, menudo arte! 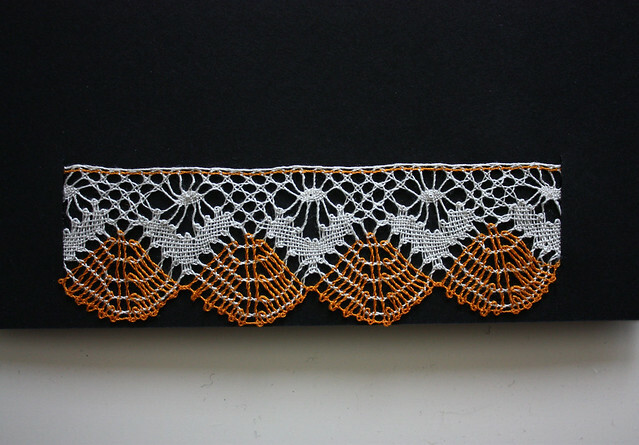 Hola Rodrigo...(I'm a copycat:-)Interesting story of the progression of your lace knitting. Only 6 months into knitting and you wanted to knit lace...hmm. Did like your first attempt with the Springtime Bandit, but must admit that for some reason I like that yarn better as the Cabled Cowl. Maybe shows the colors better...hmm. Lucky for your sister. Like you, I'm not totally enamored with Noro yarn. 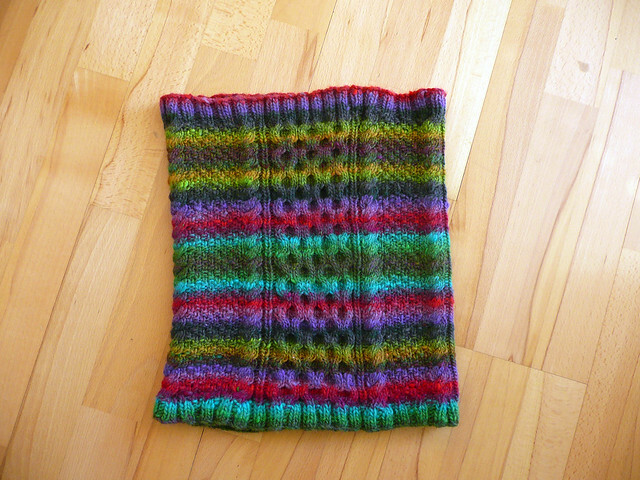 I used the Silk Garden Sock Yarn for the Noro Shawlette (see my Ravelry) and commented there that the yarn was scratchy. Yes, it softened some after washing, but not enough that I would want it on my feet! I love their colors, but I haven't chosen it again for a project...hmm. I had to go back and look again at the Hyrna Herborgar. I do like those colors together, so have no doubt the Aeolian will turn out just as beautifully. However, I had the thought that perhaps the cause of some of your craziness is due to hanging out with crazy friends...hmm. Your bobbin lace piece is truly beautiful. The orange "fans" still make me think of resting moths...hmm. And "It is so nice and relaxing to work on bobbin lace"??...hmm. You are such a creative person, and being a perfectionist certainly produces beautiful finished objects. A pleasure to look at:-)...hmm. I totally agree with you. The yarn looks much, much better on the cowl. I still have another cowl (exactly the same but white) unfinished! It has been there waiting for about a year! Lazy me! After having made this cowl and a BSJ with Noro I decided that it was enough of it. Too much money for something that is no really worth it. But it was nice to have the experience of trying Noro. The bobbin lace... yes, I know it sounds maybe weird but it does relax me. Once I get the pattern it flows very nicely and I love the sound the bobbins make when I move them to make the turns and crosses. It is very musical somehow.